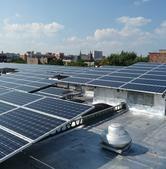 The City of Hoboken and EnergySage have partnered to help you go solar and save money! The City of Hoboken has partnered with Sustainable Jersey and Energy Sage to bring you a new tool that gives you quotes from up to eight pre-qualified contractors. All of the options (including renting versus purchase) are provided in direct comparison, so you can choose the best option. It is a “Challenge” because Hoboken is competing against other municipalities in NJ to achieve the highest number of new solar installations. Join the Hoboken Solar Challenge today! Since we installed the solar array on our condo building (151 2nd Street) the association has been able to save thousands of dollars on electric bills, enabling us to maintain a low maintenance fee and even build reserves quicker to pay for other improvements. Modern solar inverter technology can even provide emergency or backup power during outages like the one caused by Superstorm Sandy.